By JJ: Since the Hugo Voter’s packet has not yet arrived, if you’d like to get a head start on your reading, you can use this handy guide to find material which is available for free online. Where available in their entirety, works are linked (most of the Novelettes and Short Stories are free, as are the Pro and Fan Artist images, and many of the Semiprozines and Fanzines). Worldcon chair Kevin Roche at the live announcement in San Jose. The finalists for the 2018 Hugo Awards, John W. Campbell Award for Best New Writer, and the World Science Fiction Society (WSFS) Award for the Best Young Adult Book were announced March 31. There were 1813 valid nominating ballots (1795 electronic and 18 paper) were received and counted from the members of the 2017, 2018, and 2019 World Science Fiction Conventions. For the 1943 Retrospective Hugo Awards, 204 valid nominating ballots (192 electronic and 12 paper) were received. Voting on the final ballot will open in April (date unspecified). The Hugo Award winners will be announced Sunday, August 19. 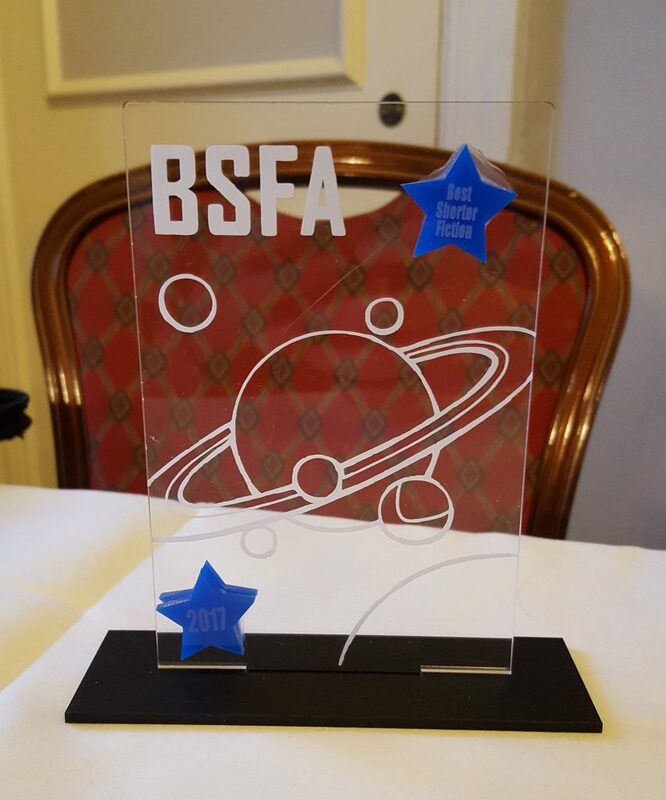 There were 204 valid nominating ballots (192 electronic and 12 paper) received from members of the 2017, 2018, and 2019 World Science Fiction Conventions. The final ballot to select the winners will open in April 2018. The winners of the 1943 Retrospective Hugo Awards will be announced at a ceremony on Thursday, August 16. The 2017 Aurealis Awards were announced at the Australian National Convention in Perth on March 31. (2) THEORIES OF EVOLUTION AND TIME TRAVEL. The Conversation’s Jordi Paps says the answer to the question “Would stepping on the first butterfly really change the history of evolution?” depends on how you believe evolution works. Science fiction writers can’t seem to agree on the rules of time travel. Sometimes, as in Doctor Who (above), characters can travel in time and affect small events without appearing to alter the grand course of history. In other stories, such as Back To The Future, even the tiniest of the time travellers’ actions in the past produce major ripples that unpredictably change the future. Evolutionary biologists have been holding a similar debate about how evolution works for decades. In 1989 (the year of Back To The Future Part II), the American palaeontologist Stephen Jay Gould published his timeless book Wonderful Life, named after the classic movie that also involves time travel of sorts. In it, he proposed a thought experiment: what would happen if you could replay life’s tape, rewinding the history of evolution and running it again? Would you still see the same movie with all the evolutionary events playing out as before? Or would it be more like a reboot, with species evolving in different ways? (3) RESOLVED. Rocket Stack Rank will comply with Charles Payseur’s request to drop him from the list of reviewers they track. OK, we've removed your recommendations from the Best SF/F by People of Color and all the Best SF/F and New Writers pages (basically all the new dynamic tables). Your recs in the old static tables will be fixed after Norwescon when we migrate them to dynamic tables. WFC2018 will be held at the Baltimore Renaissance Harborplace Hotel, Nov 1–4, hosted by the Baltimore Science Fiction Society (BSFS) and Washington Science Fiction Association (WSFA). (5) THE BRADBURY FAMILY. On April 19, the Pasadena Museum of History presents a lecture by one of his daughters about “Growing Up with Ray Bradbury”. Ray Bradbury’s daughter Ramona invites you to pull up a chair in her virtual living room as she shares an intimate evening of memories about growing up in the eclectic Bradbury household in the Cheviot Hills neighborhood of Los Angeles. The format is a conversation with historian Richard Schave (Esotouric Bus Adventures, Los Angeles), followed by a Q & A session. Ramona will reminisce about life with her famous father, and share rare family photos and stories of weekend excursions to Hollywood Boulevard book shops and the Palos Verdes Peninsula (made more adventurous because her father didn’t drive! ), eccentric family friends, special gatherings, and important public events. Like the popular 2011 Ernest Cline science fiction novel on which it’s based, “Ready Player One” is an extended valentine to those pop culture relics, most of which came out in the ’80s and are thus beloved by people who grew up watching, well, Steven Spielberg movies. Spielberg avoids any allusions to his own films apart from a stray dinosaur who may or may not hail from “Jurassic Park.” But as one of the undisputed high priests of American popular entertainment, he is in many ways enshrining his own legacy. Frankly, I wish he’d been more careful with it. (7) BOSON PURSUIT. Researchers say a “Higgs factory a ‘must for big physics'”. Physicists had hoped that the [Large Hadron Collider] would turn up evidence of physics phenomena not explained by the Standard Model. So far, efforts to detect new physics have come away empty-handed, but studying the Higgs in more detail might break the impasse. (8) VOYAGE TO THE MOON. A Kickstarter to fund the English translation of Georges Méliès’ autobiography hit its target in the first couple of days. 81 years ago, at the age of 77, Georges Méliès – the father of narrative and fantastical film – hand-wrote his autobiography; the story of the creation of cinema from not only a firsthand witness but also its greatest innovator. It has been completely unavailable since 1945 and has never been translated into English. This is one of the great unseen texts of cinema history. I’ve had it translated. And it’s GREAT! Reading it blew my film-loving mind. A voice from history telling me in his own words about how cinema began and his role in it. Now I need your help to rescue this important, illuminating and fascinating testimony, to get it back into print and where it truly belongs – in our hands and on our bookshelves. …. In 1937, a year before he died, he wrote longhand a 32 page autobiography detailing his life, his work and his observations on both. He sent it to a film historian who was writing a book about him. The first 500 copies of this book were packaged with a facsimile of the manuscript. What remains of that print run exists now only in the jealously guarded collections of film enthusiasts who have been lucky or wealthy enough to secure one. This memoir is an enthralling story in which Méliès guides us from his childhood into his early career, explaining how all of the elements fell into place to put him in the perfect position to become a pioneer of cinema. He talks about becoming one of the first people in the world to see a projected moving image at a private demonstration by the Lumiére brothers and the international mission this inspired him to take to become a part of the new medium. He explains how and why he became the first impressario of cinema, how he built France’s first film studio and how he invented special effects techniques and helped define the very format of cinematic film. More than this, it’s a human story; at times braggadocios, joyous, humble and bitter. We learn how times and the industry changed, how he became the first victim of film piracy and how he ended up in his old age, forgotten, broke and selling toys and sweets in a tiny stall in Montparnasse train station. Most interesting to me was discovering that he was a man already aware of his legacy and surprisingly unhappy about how he could see he was going to be remembered. His memoir crackles with life and is a vivid account of the dawn of movies from its most colourful participant. (9) HEAR FRITZ LEIBER. Fanac.org’s new YouTube video pairs a sound recording of Fritz Leiber’s “Monsters And Monster Lovers” talk from the 1964 Worldcon with selected images. Pacificon II, the 22nd World Science Fiction Convention, was held in Oakland, CA in 1964. In this interesting audio with images, Fritz Leiber speaks eloquently about his favorite literary monsters (from Yog Sothoth to the forest in Peer Gynt), the relationship of science fiction to traditional monsters, why we are drawn to these characters, and on horror in a time of war. The first 10 minutes or so are a loving listing of characters, and the meat of the talk starts after that. This material was provided by The Southern California Institute for Fan Interests (SCIFI), and Jerome Scott, Director of Projects for SCIFI in LA. (10) MAYNARD OBIT. Bill Maynard (1928-2018): British actor, died March 30, aged 89. Genre appearances: You Too Can Have a Body (1960), The Boy with Two Heads (all seven episodes, 1974), Zodiac (one episode, 1974). March 30, 1988 – Beetlejuice premiered. The Hollywood Reporter has reposted its review of the film. March 30, 1990 – Teenage Mutant Ninja Turtles hit theaters. (12) BIRTHDAY AUTHOR. Steven H Silver’s “Birthday Reviews” series at Black Gate celebrates “Chad Oliver’s ‘Transformer’”. Oliver’s writing career began with the publication of the short story “The Land of Lost Content” in the November 1950 issue of Super Science Stories. He published short fiction through his career, with his final story published in 1991. During that time, he also published six novels and collaborated occasionally with Charles Beaumont and Garvin Berry. His 1984 story “Ghost Town” was nominated for the Nebula Award for Best Short Story. (13) WILD ANIMAL WARNING. 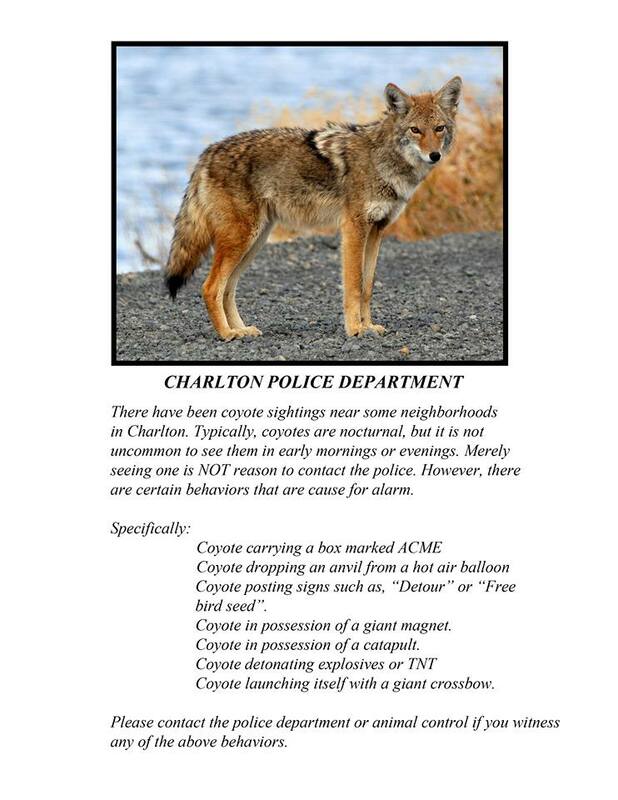 Your Charlton Police Department knows some coyotes are more dangerous to themselves. (14) ACE REPORTER. 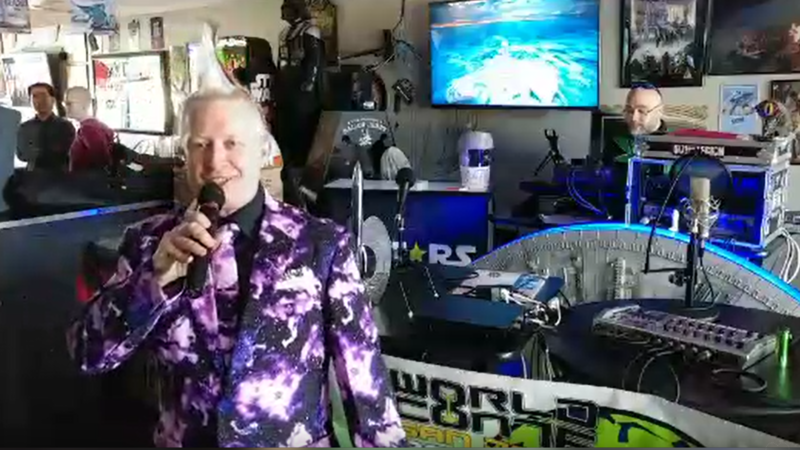 Jon Del Arroz says he will be on hand for the Hugo finalist announcement at the 7 Stars Bar & Grill in San Jose tomorrow. The bar’s online schedule promises there will be Bottomless Mimosas and karaoke on Saturday – no wonder he can’t stay away! (15) FREE READ. The winner of the “Quantum Shorts” fiction contest has been posted. Scientific American and Nature partnered with the Center for Quantum Technologies in Singapore, which organizes the annual competition…. The mind-bending possibilities of quantum physics lend themselves to philosophy—to wondering about the theory’s implications for the meaning of life, the idea of free will, the fate of us all. A talented pool of writers have capitalized on those implications to produce an impressive array of entries in this year’s Quantum Shorts contest, which invites short fiction based on the ideas of quantum mechanics. 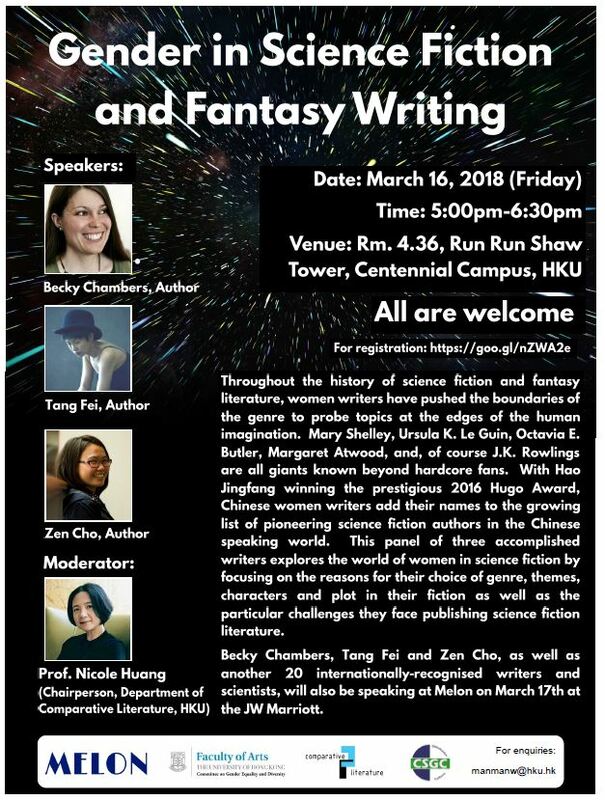 Scientific American and Nature partnered with the Center for Quantum Technologies in Singapore, which organizes the annual competition. Judges, including Scientific American and Nature editors, selected a winner and runner-up in two categories—“open” and “youth”—and online voting identified a “people’s choice” favorite; all winners will receive a cash award, a certificate and an engraved trophy. Among other things is an essay about how I was treated as a handicapped student by gym teachers while I was in the public schools during the 1970’s. There is also an essay about how the Big Tech companies such as Google, Twitter and You Tube have been using their power to censor political speech by conservatives and socialists and how this all ties in with the allegations that all anti-establishment activity is tied in with Vladimir Putin and his gang in Russia. There is also an essay about irresponsible rhetoric such as Guy H. Lillian III’s defense of Al Franken and this Daniel Greenfield character who claims that we are on the verge of “civil war” because there is a great deal of opposition to the Trump Administration. There is also a look back at the Solar Empire game of yesteryear. There are also some essays by both Robin Bright and Gerd Maximovic as well as poetry by Denny E. Marshall. (17) RED PELT, BLUE PELT. Huffington Post reports “Alt-Right Furries Are Raging Online, And Leftist Furries Wonder What Is To Be Done”. …However, the vocal subgroup of Alt-Furries has been hard at work asserting their space within the movement of late, and it’s this very spirit of inclusivity they wish to expunge. people with serious mental problems,” the unnamed author of Nazi furry erotica “The Furred Reich” told The New Statesman, which has been doggedly covering the Alt-Furry scene for years. The core furry community, then, finds itself in quite the bind: Can a group founded upon the idea of consummate tolerance embrace a clique that’s so staunchly intolerant? For the opposing furries leading an outright fight against the alt-right, the answer is no. Dogpatch Press, a furry news source offering “fluff pieces every week day,” often rails against Alt-Furries and their attempts at indoctrination. In February, a Dogpatch writer with the fursona Patch O’Furr published a “deep dive into the Altfurry mission to ‘redpill’ fandom with hate,” warning readers about the #AltFurry mission to indoctrinate members of the fandom and spread its white supremacist teachings. According to O’Furr, furry fandom is a perfect venue for alt-right recruiters. Just as Pepe the Frog (RIP) served as a seemingly harmless, comedic package through which to promulgate racist, misogynist and xenophobic beliefs, fursonas can act as effective, hirsute fronts for extreme views. As Furry fandom member Deo elaborated in a Medium post, furry communities ? often populated by “socially awkward internet nerds” ? are prime targets for alt-right trolls, who target young people, outsiders and insecure, white men. (18) KERMODE. Here are three recent genre film reviews by YouTuber Mark Kermode.